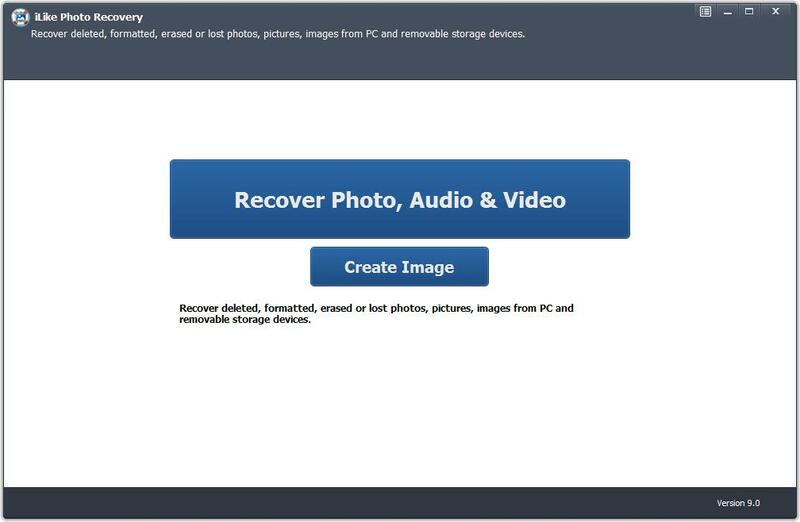 Professional Photo Recovery Software Specially Designed to Recover Lost, Deleted, Corrupted or Formatted Photos, Videos and Audio Files from Various Storage Devices Including SD/Memory Card, USB/Local Drive, Camera, and Mobile Phone. No matter if your files were deleted, reformatted, lost, etc. No panic. Let iLike Photo Recovery help you which can find and fully restore all your precious image, video and audio files from many storage devices. It is complete Do-It-Yourself photo recovery software that recovers photos, images, songs, movies multimedia files deleted or lost due to software crash, formatted or damaged hard drive, virus attack, lost partition and other unknown reasons from PC hard drive, external hard drive, USB drives, SD card, SDHC, MicroSD card, CF card, xD picture card, digital camera, and more storage devices. The software supports all types of image, video and audio formats, such as, JPG, PNG, BMP, GIF, AVI, MP4, MOV, 3GP, MP3, WAV, etc. Image/Photo/Video/Audio accidentally deleted from digital camera. Image/Photo/Video/Audio deleted from local or external drives. Image/Photo/Video/Audio unintentionally deleted from memory card, USB drive. Image/Photo/Video/Audio accidentally deleted from mobile phones. Image/Photo/Video/Audio accidentally emptied from recycle bin. Image/Photo/Video/Audio lost due to formatted partition/drives/external drives. Image/Photo/Video/Audio lost because of memory/SD card failure. Image/Photo/Video/Audio lost due to damage of your digital camera. Image/Photo/Video/Audio lost for other possible reasons.